Formula 1 is in a state of turbocharged metamorphosis, and not for the first time. 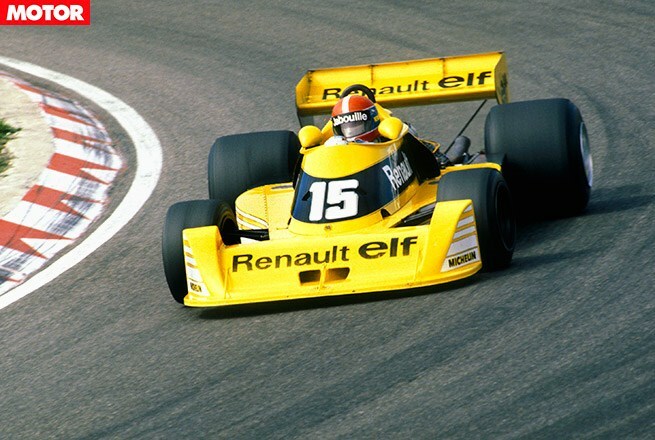 Renault’s RS01 made history at the 1977 British Grand Prix as the first turbocharged car to race in F1. It took almost two years to reach its full potential but, within three years nearly every team on pitlane had switched to turbocharging and F1 was never the same again. When engine outputs reached astronomical levels in 1986 – the BMW engine is widely believed to have topped out at 1044kW – the FIA moved to rein in manufacturers, firstly by limiting boost in 1987, then by banning turbocharging at the end of 1988. It was a short-lived era, just 11 years, but it changed F1 forever. And now, it’s back. In less than a fortnight we will finally witness the second-coming of turbochargers in Formula 1. In the March issue of MOTOR we explain the return to turbocharging, explore the new technology and relive the fear of the turbo glory days, when men were forged from iron and tamed 1044kW animals. The obvious Renault for this list is the RE10, the first turbocharged car to win a grand prix. But for sheer persistence, the RS01 gets my nod. Renault’s doggedness in the face of criticism and outright ridicule defines the Frenchies’ pioneering spirit. The car was co-designed by driver Jean-Pierre Jabouille, who put it on pole just 18 months after its debut, and it changed the face of F1 for the next decade. The RS01 is a worthy hero. Widely regarded as the ‘prettiest’ F1 car ever built, the Gordon Murray-designed BT52 was proof positive that form and function need not be mutually exclusive. Powered by BMW’s M12/13 1.5-litre four-cylinder turbo, the BT52 earned its place in history as the first turbo-powered car to win the world championship. Remarkably, BMW’s F1 monster, which produced up to 671kW in qualifying trim, was based on BMW’s standard 1.4-litre M10 unit, first seen in its road-going cars in 1961. Astonishing. It wasn’t the best car but its simple design, resplendent in its classic black-and-gold John Player Special livery, made it irresistible. Add in a young Ayrton Senna – yet to win a race in F1 – and an icon was born. The 97T was one of the quickest cars on the 1985 F1 grid, with eight pole positions, but what it had in outright speed, it lacked in reliability. At season’s end, the 97T had scored three grand prix victories, one to Elio de Angelis and two to Senna, including his remarkable maiden win in Portugal. That race is enough to assure the 97T legend status. Benetton’s first attempt as an F1 constructor will long be remembered for the B186, a car still considered out of this world. With BMW’s M12/13 1.5-litre turbo unit bolted to the back (by now developed to the level of lunacy) the B186 easily topped out in the power stakes, forcing the FIA to change the rules. In qualifying trim, the B186 was reportedly producing around 1044kW, making it regularly the fastest car on the grid (Gerhard Berger clocked a V-max of 351.22km at Monza, F1’s fastest track). Reliability problems hampered its underlying speed but Berger did score one victory in Mexico. The win was a first for Berger, a first for Benetton and the last for BMW as an engine supplier in the turbo era. The marriage of the Steve Nichols and Gordon Murray-designed MP4/4 to Honda’s RA168-E 1.5-litre V6 turbo unit that had just powered Williams to the 1987 world title represents the apogee of F1’s first turbo era. In the hands of Ayrton Senna and Alain Prost, MP4/4s won 15 of that season’s 16 grands prix, making it the most dominant Formual One car ever. Senna won the first of his three world championships, that feat alone enshrining the MP4/4 in the pantheon of F1 greatness.